The thing about walking on these mountain roads is finding a place to get off them and strike out across country. As they are cut into the hillside you usually find yourself hemmed in by a high and unclimbable bank. 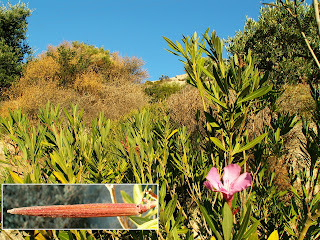 The trick here is to look for the place where water crosses the road which can often be spotted by lines of Oleander straggling up and down. Where water comes down we can often go up such as at this spot here. Let’s give it a try.